Library collections, by their nature, are optimally organized and arranged for efficient location. A misplaced or misfiled item can hinder the overall operation. 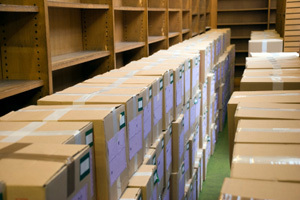 As a result, the move of a library collection is unlike any other relocation. Without strict adherence to overall organizational structure of the collection during the packing, transportation and unpacking process, there’s an increased chance of patrons being unable to find information when the move is complete. Therefore, a library relocation has little room for error. Our project managers also oversee the physical library room move operation to guarantee success. During the complete move process, you’re provided with a single point of contact to assure optimal communication. During the move of your library, we utilize trained professionals with a proven track record of successful past experience. Their expertise extends from not only operating the necessary, highly specialized equipment and vehicles integral to protecting your collection but also understanding the particulars of library layout, logistics and organization. No matter how granular the indexing of your collection, we maintain structure and preserve the integrity of your library assets. We utilize special carts built specifically for the handling and preservation of books. Each cart is labeled and shrink wrapped prior to be transported. Michigan Office Movers also offers specialized expertise in disassembling, reconfiguring and installing library stacks. Whether you have a phased internal transfer or large scale external relocation, Michigan Office Movers will execute a seamless move of your library collection. To find out more about how we can help you achieve the most successful library move possible, contact us by phone or fill in the form on the page.